August 7, 2017 By Allyson 199 Comments This post may contain affiliate links. Read my disclosure policy. 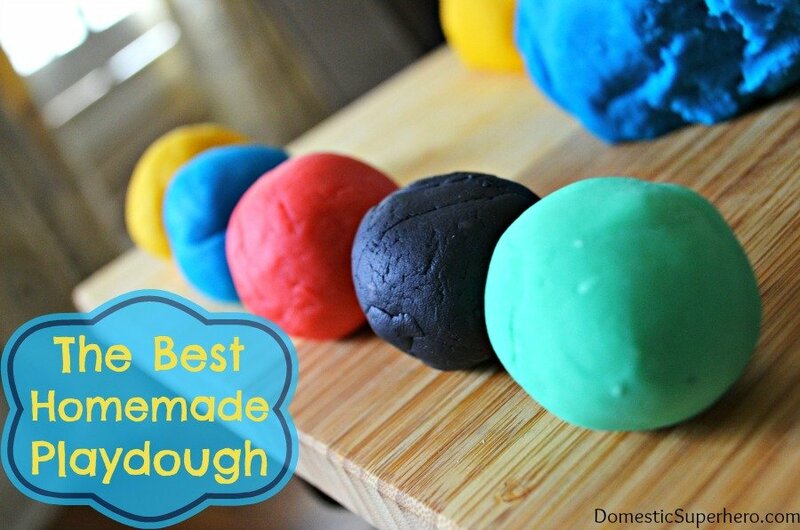 The BEST Homemade Playdough – I have tried every recipe and this is by far the best! Lasts 3+ months, coloring does NOT stain hands, and it’s super easy! Over the years I have tried at least 10 Homemade Playdough recipes, and some have been big hits, and some have been big misses. I feel like I have finally figured out the best recipe for Best Homemade Playdough, and I am going to share it with you!! It is pretty easy, and involves ingredients that you likely have at home all the time (except maybe you don’t have cream of tartar…maybe…). This recipe is quick, yields a lot of playdough, and the playdough actually stays good for a long time. This would work great as a class activity for kids, or as a home activity for kids. It really is a great indoor activity! 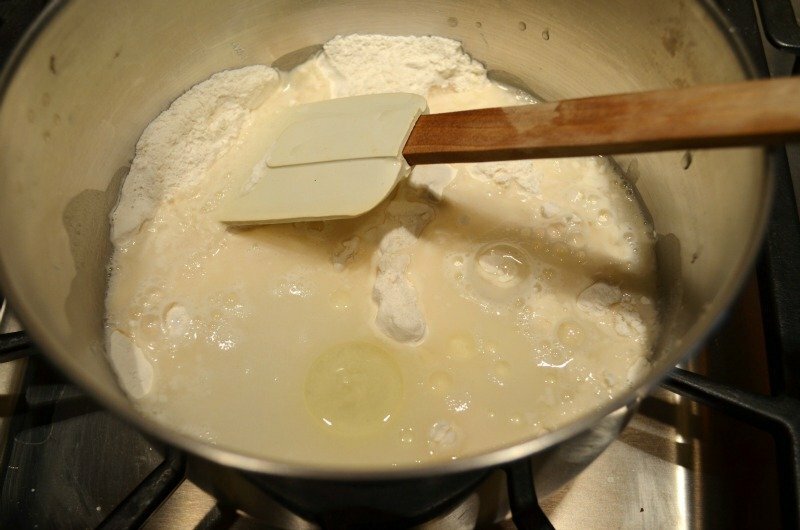 In a medium saucepan, add 1 cup of flour, 2 teaspoons of cream of tarter, and 1/3 cup of salt (the salt keeps it from sticking and also helps preserve it). Before it starts getting thick (this is going to happen fast, so be ready) you want to add whatever color food coloring you want. If it gets to thick before you add it, it’s hard to get an even color. Add the color and stir! Keep stirring, it is going to start thickening up. This could take anywhere from 30 seconds-2 minutes depending on how hot your pan/stove is. Now you can see it’s getting thicker, keep stirring, and keep scraping the bottom of the pot. 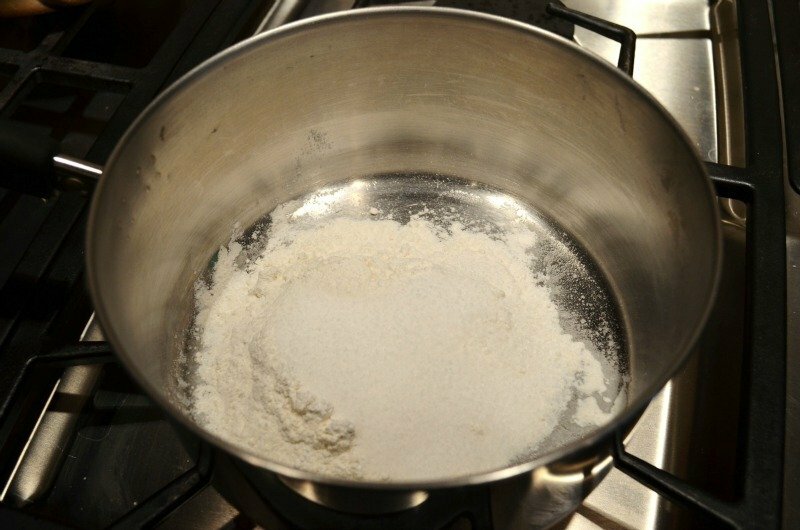 Once you notice the dough isn’t wet anymore, take it out of the pot. Like I said, the whole process shouldn’t take more than a few minutes. it goes really fast, and even faster when you make additional batches because the pot/stove is already warm. Put the dough on some wax paper and allow to cool (30 minutes or so). Then take the ball in your hands and knead for a few seconds (like 30 seconds). Store in a zip-lock bag or airtight container IN THE FRIDGE. It shouldn’t dry out, but if you notice it getting a bit dry you can add a few drops of water and knead that into the dough. 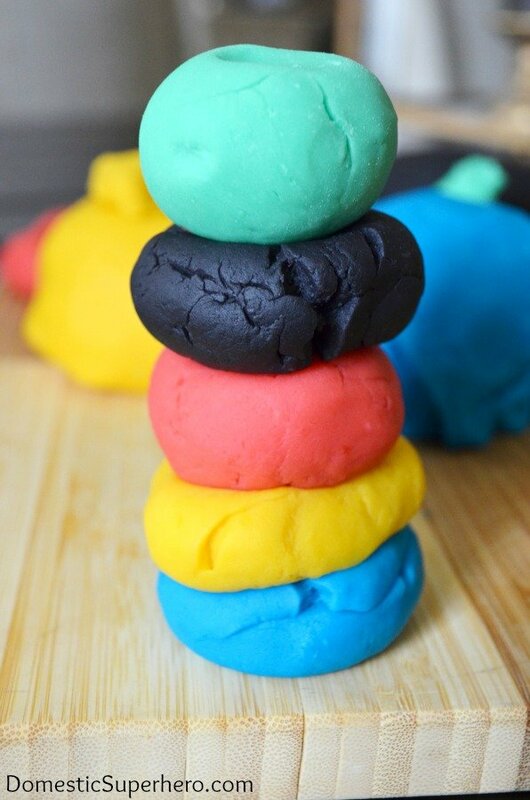 You can also add a drop or 2 of scented essential oil to make the playdough smell great! Store in an airtight container in the fridge! The above will make you ONE large ball of playdough. I usually make it repeatedly for however many colors I want (so if you want 6 big balls, know that you will need 6 times the ingredients listed above, but you need to make them separately). Love it Allyson! 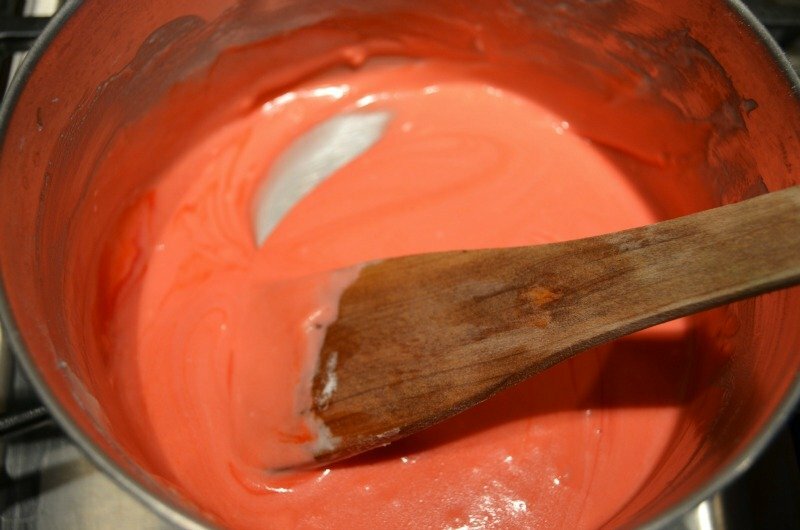 & great idea; adding the food coloring while still mixing the flour on the stove! I will give this one a try too! I was just playing with it with my son tonight and he was obsessed! I hope they like it just as much! Added glitter. PRETTY awesome!!! Thanks!!!! GREAT idea! I’m going to try the glitter too! My granddaughters will love it! Thanks so much!!! It looks and feels like the real thing, it’s awesome! stopped by from pin me- Pinned!!! Thank you for the tip what to do when it becomes too dry, I used to think it’s gone, but I’ll definitely try to add some water next time it gets dry! Found you via Diana Rambles Pinme party. Add cheap good smelling hair conditioner, to better thr stank smell, and to help keep it from drying out. Never heard that tip! Sometimes I add a few drops of essential oil and that helps too! Hi! Followed you over from My Turn (for us) blog hop. Can’t wait to try this. Pinned it and am now following you on FB. I hope they like it! My 2 year old is obsessed! so can’t wait to try it for my grandson. It is so easy, and totally worth it! Trust me, they will love it! I know! Spring break is so long if you have nothing to do! This is a great time passer…both making it, and playing with it! Thanks for stopping by, Britney! 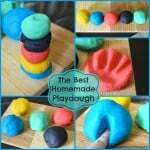 Your play dough looks awesome. I feel like whenever I make some, it’s an epic fail! I need to try yours….if it worked for you, maybe it’ll work for me ! THanks for sharing at Pinworthy Projects. I bet you won’t fail if you try this recipe! So colorful! Thanks for sharing this at my Pin Me Linky Party. I hope you come visit & link again. Your playdough does look better than many I’ve seen. Please consider sharing it on Look What We Did, a month long link up hosted by HammockTracks. As a matter a fact, I think you have many posts that would link up well there. Thanks for the sweet comment and stopping by! I checked out your site, but I didn’t see the link up…can you post the link? Thanks! I have not made play dough with my girls in a LONG time. I so need to do it again! Thanks for sharing on We Made That! Hi Lovely, I am your newest follower from Blog Hop. 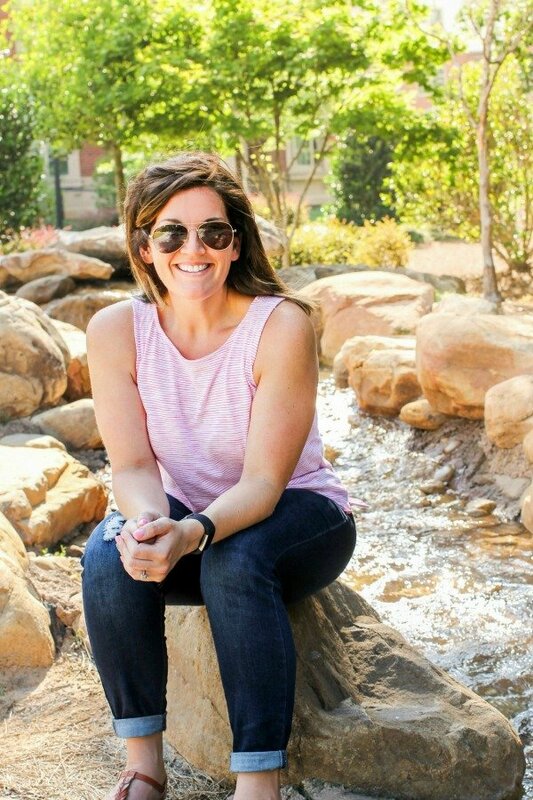 Love your Awesome blog! Followed you via Twitter & FB. Thanks girl! I am going to check you out and do the same! Cheers! Hello do you have a recipe if I want to use my kitchen aid ? When I cook it I have noticed it’s not as dense and spongy as I would like it’s a little stringy when I pull it apart do you have any suggestions? This is the best recipe I have. not sure what’s happening on your end as I have never had an issue with it being stringy. I would make sure you are measuring the ingredients carefully and following the directions. Let me know how you like it! I bet it turns out great 🙂 Mine is still going strong! This play dough looks awesome! I need to make some for my daughter because she goes through it really fast and this will be tons cheaper. I’m pinning this! Thank you so much for posting this and with the pictures. My son was just informed he has celiac and cannot play with regular play dough. I just took out the flour and put in a Gluten Free Flour as the rest of the ingredients are ok. His daycare has play dough all over so I am now preparing to make new stuff for the daycare. Wish me well!! What a great idea! I hope it works out! I’m hosting a baby shower in a fortnight, and I need a LOT of playdough, does this recipe keep well? It looks amazing! YES! What you need to do is put each ball into a zip lock bag, and keep it in the fridge. I still have the playdough I made from this very post nearly 3 months ago in the fridge, and it’s the same as it was the day I made it! Can you use coconut oil rather then cooking oil? Hmm, I am not sure, but I would imagine it would probably work. Why the aversion to cooking oil for this? It’s way cheaper! Thanks for the heads up! I am going to check it out! I mixed the food coloring with the liquids in a bowl and it came out good it was easier for me that way. I am not sure because I haven’t done that. I would give it a try, and maybe include on a tag that it should be refrigerated in the containers. Good luck! Btw, made this with coconut oil & it worked out great! Monica, we make something very very similar to the recipe and give it away in plastic containers all the time! It keeps just fine. Ours keeps for many months in plastic bags and not refrigerated. Some have even lasted over a year! That’s a bummer! I have never had or heard of an issue with the smell. Have you let it cool and refrigerated it? That might take some of the smell out. Otherwise I would just try adding a drop or 2 of scented essential oil (like lavender, lemon, peppermint etc) to each ball. That might help! I used coconut oil instead of vegetable oil. It gave the dough a great coconutty smell and it seems to be holding up just as well as my batch of dough that i made using the vegetable oil. Thanks for letting us know, Shelley! I am going to make a note of this in the recipe! Thanks for coming by! I’ve been making this same awesome recipe for 3 decades, except I mix 1 package unsweetened kool-aide with the flour and omit the food coloring. The kool-aide colors the playdough AND makes it smell wonderful. If you are worried about the delicious smell enticing the kid’s to eat it, don’t worry–it still tastes gross! I just made this and it seems great so far – putting the food coloring in while cooking made my colors come out great! 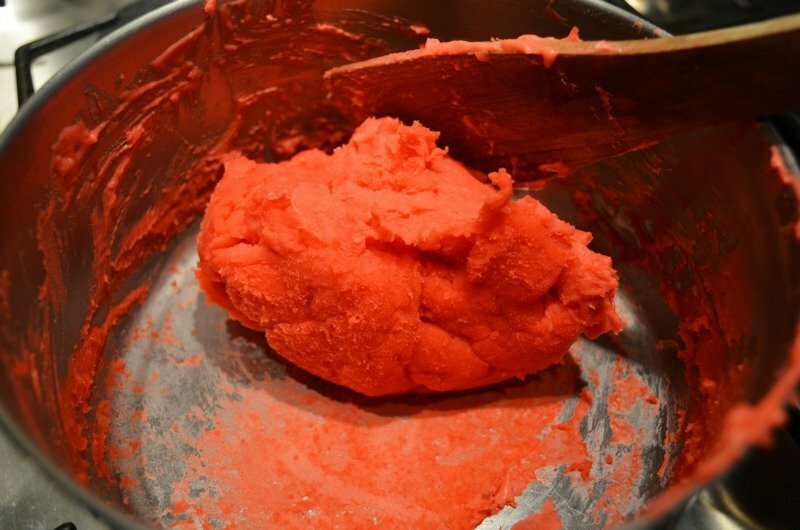 Last time I made play dough from scratch (different recipe), it got all funky and kind of oily/wet after a while – any issues with this dough becoming ‘wet’ over time and any way to correct it and ‘bring it back’? Mine did not ever get ‘wet’ afterwards. I would make sure you let it cool completely and then put it into the ziplock bags and store it in the fridge. I didn’t have any issues! I hope you don’t either. Like I said, I have tried tons of recipes and this has been by far the best one! I am so happy you made it and loved it! mine kept very well over 3 months, and then it got a little iffy, and then I finally saw some mold on it (eek!). I have made it time and time again though, and like I said, it’s the best! Make sure you store it in the fridge! I’d love if you would share a picture of it/your kids playing with it on my facebook page! I really have no idea, Ryann! You can give it a try and let me know…I have only tried it with regular. Thanks for coming by! I made this today and it was awesome!!!! Thank you so much for sharing your recipe! We will be using this for years to come! I am so happy you tried it and liked it!!! Feel free to share with your friends, too! Thank you! I hope you’ll come over and follow Domestic Superhero on facebook too! I love this! I made this for my son and he absolutely loved it. I found your step-by-step pictures and hints extremely helpful. Very easy to make, and I like the fact that I know exactly what went into the play dough. Thanks for the great recipe! I am so happy to hear that it turned out well for you, Tam! It really is the best recipe that I’ve tried as well, which is why I had to share it with everyone!! Thanks for stopping by! have you used this and PURPOSELY dried out the shapes you made?? Does it crack?? I have made sooooo many “clay” recipes…but they “crack” when drying 🙁 this looks great…wondering if it dries well???? Angie, I have no idea because I have never tried that! I wonder if it would? I would suggest just making 1 batch and trying it out. Let me know how it goes! This is the exact recipe my mom always used when we were kids except we added the color as we kneaded it to cool it down. That was always my favorite part. I forgot about all the times we made play dough together. I will have to make a batch up with my kiddos soon. Also, the best thing we found to store it in was the store-bought icing containers. Thanks for sharing! That’s such a wonderful testament to how great this recipe is! I am so happy it works for you with the rice flour so that your students can enjoy it! Thanks for coming back to let us know! That’s interesting! I have never tried baby oil, but I have never had an issue with vegetable oil smelling bad. I have had it stay good for months in the fridge, no smells! I suggest putting your drops of food coloring in the water and mixing it before it goes into the pot with the rest of the ingredients, I’ve done this as a class experiment with my preschoolers and it helped me avoid the stress from mixing and trying to get an even color. It made things much more simple for me! Great tip! For me it works just fine adding it when I usually do, but this would also be easy as well! Thanks for sharing! I make it for our preschoolers and I use the microwave for 5 minutes stirring every minute and scraping sides, I add food coloring and stir right before I put it in the microwave. When it cools to the touch but still warm knead it several times to make sure color is mixed well. How am I just finding this now? Oh well, good timing! My granddaughter just started playing with play doh! She’s 2 1/2 and will love playing with it at grandma’s house with neon colors! Is the cream of tartar necessary? I don’t have any. I have never made it without the Cream of Tartar, so I can’t tell you that it will come out great without it. I know people can sub baking powder in it’s place in other recipes though, so maybe try that. If you want to hit up the grocery store you will find it in the spice aisle for only a couple bucks! A little goes a long way, too! Has anyone tried this recipe but adding essential oil for sent? I have had people tell me they have added a few drops successfully! Pinned! Looks like an excellent recommendation from Pig & Dac! Mine has lasted about 3 months in a sealed container or bag in the fridge. Does the food coloring color your hands as you play with it? Thank you! We made this last night and the kids loved it! Love this. Play doh still in good shape after a month of daily use. I cut the recipe in half though and it made me a ball about the size of a baseball. I add the essential oils and color when the mixture is pre-lump stage. Also did this with coconut oil and it turned out wonderfully. Invest in some essential oils (for everyone asking how to make it smell better) and it adds a great touch to your playdoh. In regards to it drying out, I wonder if adding a few drops of water and a tiny bit more coconut oil to it….microwaving all of them for about 10 seconds and then kneading it would help? Not sure but I will have to suggest it to my sister! This is the same recipe my mother passed on to me, and I have found that it is best not to add any heat until all the ingredients are mixed together, and adding essential oils is a fabulous way to bring in another sensory play. I make this for my girls. I added vanilla extract. It gives it a great scent. Anyone know how to not get the white residue while playing with the playdoh? This recipe leaves more white residue than typical playdoh. I am not sure what you mean, White residue? I haven’t experienced that with this or any playdough. When you play with the playdoh, it leaves like tiny little crumb-like residue. Maybe I should add a couple drops of oil? This is very similar to the one we love. But I love to add the food coloring while I knead it. 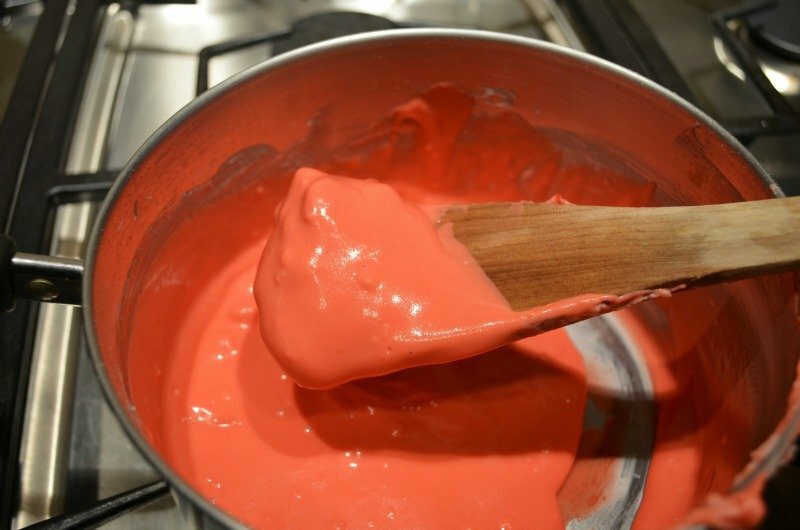 That way we usually get 2 colours per recipe. We also add essential oils and it smells wonderful!! And keeps forever. Thanks for the recipe. This is the first time I tried out something so fast and it turned out just amazing. my kid is thrilled. the finish is so smooth and the color amazing. I have been using this recipe for the majority of my life and as a child care provider have made it countless times. It is the best! Here are some ideas: Add a packet of Kool-Aid to both color and scent it. Glitter is a fun add-in also. In the fall, we add cinnamon, cloves, or all-spice to color and scent it. Adding a couple drops of glycerin will add some shine ands help to moisturize dry hands. We give as gifts and it always puts a smile on a little one’s face. It is perfect for Valentine’s in a classroom. In my experience, each batch makes enough for 4 kids to have a moderate amount, slightly less than a can of Play-do. Coconut oil works well in place of the vegetable oil an adds a nice scent but it leaves the playdough a little drier than adding vegetable oil. That sounds awesome! What great tips! 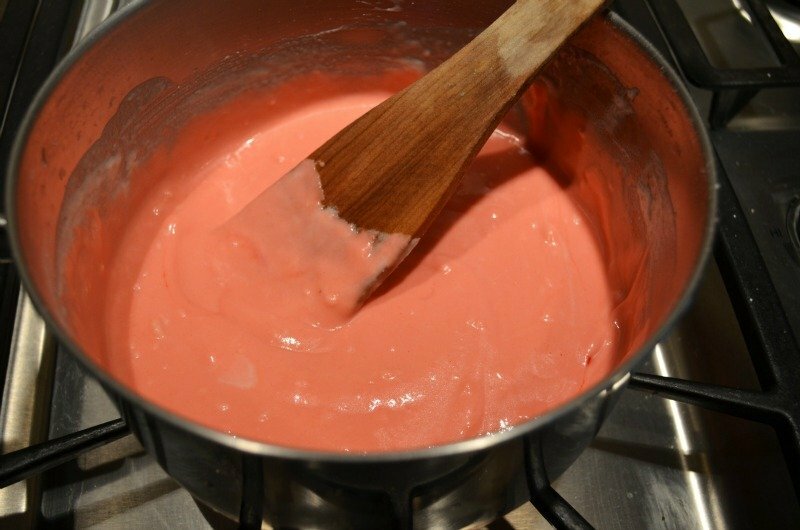 I wanted to avoid mixing the ingredients together 6 times, and cooking/washing the pot 6 times for the different colours, so I made a double batch and added the colour once it had cooled enough for me to touch it. I just divided the big ball into 6, then added a few drops of food colouring to each ball and kneaded it in. You just have to be careful not to get the colour all over your hands, but it was super quick to make the colours. PS you have great colours! I have to look into buying that food colouring! When I think I’m printing a recipe for playdough I really don’t want 22 pages of peoples comments in addition to the recipe….what a waste of paper. Oh no! If you scroll down to the bottom of the post, where the actual recipe is, there is a button on the top right of the rectangle that says ‘save recipe or PRINT’, when you click print, you will only print the recipe and not everything else on the page. Alternatively, if you select print from your browser, you could set it to print only the page the recipe is on. Usually there is a print preview and it will show how many pages you are printing. Hopefully that helps next time! Thanks for the recipe! I tweaked it to make a pumpkin spice playdough. Do you mind if I cite you on my blog? As long as you rewrite in your own words and provide a link back to to recipe, that’s fine! Glad you enjoyed it! We love it! I am so happy you tried it and love it as much as we do! Can you bake this and paint it with acrylic, then varnish it? It seems with the oil maybe it wouldn’t work for ornaments you want to varnish. ??? I’ve never tried that. If you do, let me know! Good luck! Oh no! You probably needed to cook it a little bit longer to dry it more. It is our favorite too! So glad you found it and tried it out! I just made my first batch, but the color DVD stain my hands…. did I do something wrong? sorry the color DVD? What does that mean? Sorry autocorrect changed it. The color did stain my hands but only with one color and after washing several times seems to be gone. Perhaps it was something in the pink gel color. I always use this dough for my PreK class. Tonight I didn’t have salt, but I had a lot of baking soda. I needed the dough for school tomorrow. The recipe turned out fine with substituting baking soda for the salt. I don’t know if it will keep as long, but in a pinch-it is an option. What a great substitute! I have never tried that but I am glad it worked for you! Thank you! Hi, is there any substitute I can use for cream of tartar? Not that I know of! I would use it because it really makes the BEST playdough! Thank you for sharing this. I make it for my daughters friends as gifts and they all loved it. 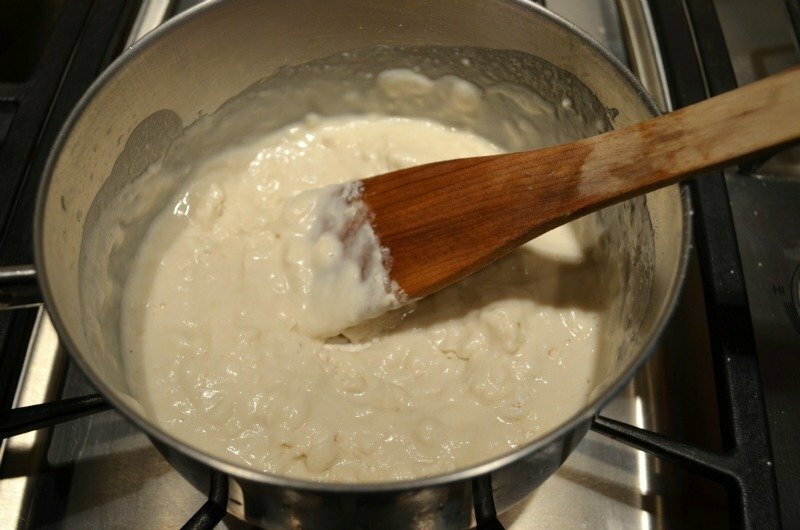 Sooth texture and so easy to make. That is great!!! Happy holidays! This makes me so happy!!! Happy playing!!! Awesome recipe. Made some this evening as I’m babysitting my niece tomorrow. 45 minutes later and I’m not sure I don’t want to share it now. It’s just like the playsough I used to play with as a kid. Yay!!! She will love it! I am shocked to hear you had a little staining! I have never encountered any making this recipes 100’s of times! What type of dye did you use? Hello, i have tried many play dough recipes and each one i make comes out perfect except when u look at your hands you find dry little pieces on your hands , i made this recipe for my kids as i have a small yet growing preschool and although from the other recipe’s i have tried, this recipe also left very little dry pieces on the kids hands, is this normal while making your own play dough ? As well as mentioning the smell i added a few drops of essence and it smelt wonderful. This looks great. I want to use it in PreK and Kindergarten classes. I do need large amounts- will it still be cheaper? Also, my entire purpose is to learn about mixing colors. What gel colors do you recommend? I need a red and blue that will make a true purple. Kathy- definitely the gel set I recommend in the post are the most vibrant ones I have found. I would order those for sure. It will definitely be cheaper to make it yourself. I would buy the cream of tarter in bulk, like this (good deal) because it gets pricey if you buy a lot of the little bottles. Does this need to be refrigerated at all? I find it keeps WAY longer in the fridge in a sealed plastic bag, so I suggest to refrigerate it! Thank you for this recipe! My kid is obsessed. Quick question: when I made this I missed the part about keeping it in the fridge. I have it in zip lock bags but it’s not in the fridge. It seems to be doing okay (looks the same as when I made it). Is there a benefit to keeping it refrigerated? I find that it keeps longer in the fridge. I highly suggest it, because I have left it out for a week and it’s grown mold 🙁 I would just pop it in the fridge – but it’s up to you how long you want it to keep! So glad y’all love it! May I share your recipe with my Kindergarten parents (with credit)? Great recipe! Tried it 5 months ago. The dough is still as the first day. Made some new today with the same success! 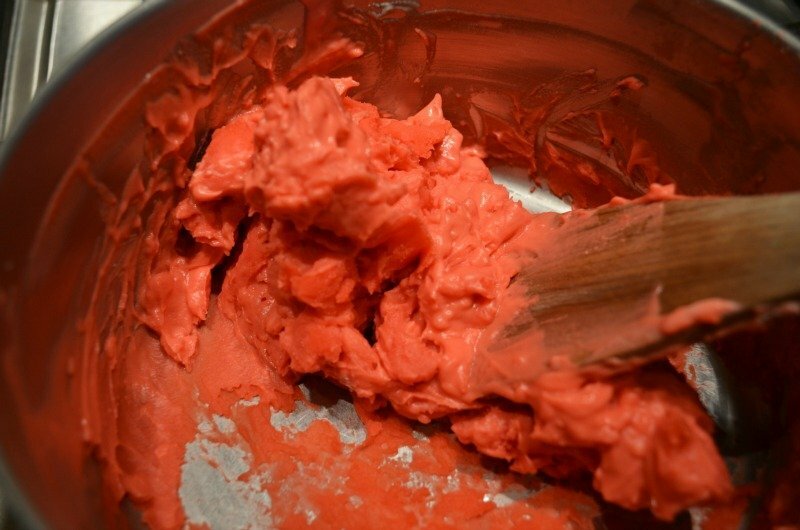 This is the softest play dough recipe. Thank you for sharing. Thank you Allyson for sharing this! I really love the idea of adding 1/3 cup of salt, which is really works to keep it sticking! I am so glad you loved it as much as we do! Made this. Waaaay to sticky. Couldn’t fix it. The search continues. I didn’t have cream of tartar and used lemon juice instead. The site I found for substitution send do 2 times what it calls for for cream of tartar – use either lemon juice or vinegar. It worked out great! Oh wow I am SO happy it worked out for you! 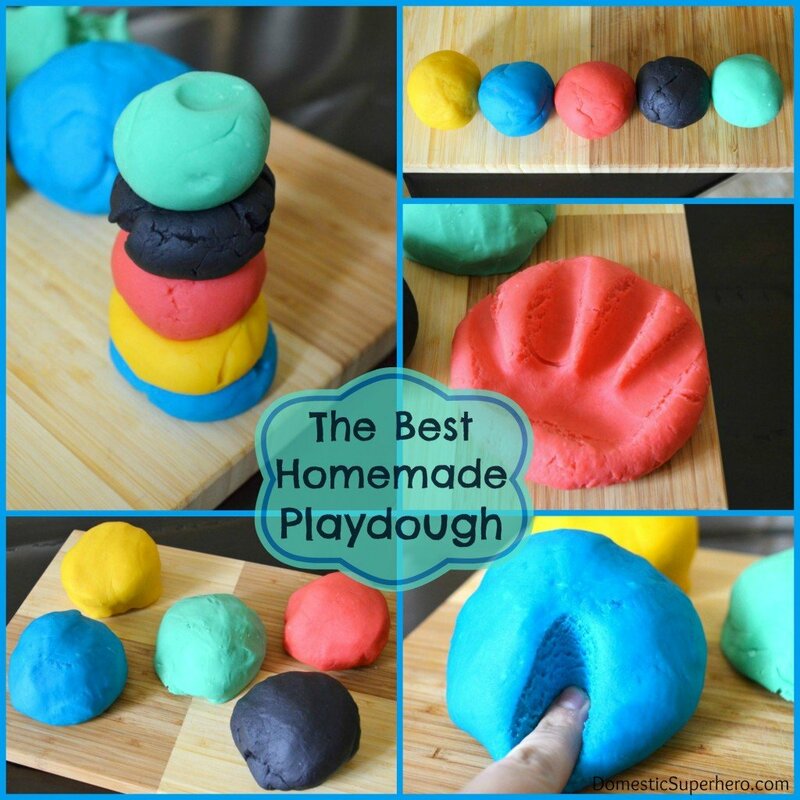 Yup…hands doen the best playdough recipe! Happy the recipe worked out for you! I want to make this for my daughters birthday party. I plan on making smaller diff color balls and putting them in baby food jars ( decorate it as if it was gumballs inside) do they have to be fridged or will the glass jars keep it fresh and useable? Great idea for the birthday party! I am not sure about the glass jars, since I haven’t tried that, but I would give it a try. Can you put them in the jars, and then in the fridge until the party? Did it end up lasting long in glass jars? I am doing the same thing for the party favors. Im thinking of using glycerin drops instead of oil also. I haven’t tried it in glass jars, but I would say whatever you do, make sure you store it in the fridge. I don’t see why it wouldn’t last in the glass jars as long as they are sealed.